The entire chapter 35 of Isaiah can be seen as a vision of God overturning the entire ancient order. It is a vision, a prophecy, a preparation for what is about to happen to God’s people. For in the very next chapter of Isaiah we are plunged into the maelstrom of history, around the year 716 BC. It is a time of war, with the Assyrian king issuing an ultimatum to King Hezekiah in Jerusalem. Certainly the old order did not end with the events of the Assyrian conquest, or the Babylonian conquest, or the Hellenistic and Roman conquests several centuries down the road. And neither has the old order disappeared in the two thousand years since the coming of Christ. The old order is still with us, in its many changing forms, so the prophecies of Isaiah continue to be visions of a new order that God will bring about. So the vision in chapter 35 of Isaiah is as much an encouragement to us in the 21st century as it was to the Jewish people 2,800 years ago. The people of ancient Israel were looking for God’s “vengeance” on the nations that threatened them – including the Assyrians and Babylonians. But notice how the “vengeance” is represented in the verse illustrated here and in the entire chapter 35. The eyes of the blind will be opened, the deaf will hear. And “then shall the lame leap like a hart, and the tongue of the dumb sing for joy” in verse 6 that follows. God’s vengeance is a time of miracles and healing. Why has that message not resonated with human beings for so many thousands of years? Even after Jesus inaugurated the time of healing? The ransomed – the redeemed, the rescued, equally good translations of the Hebrew – of the Lord shall return and come to Zion…. Or, shall return and come to Portland…. Or, shall return and come to any other town or city of a devastated earth that is healed and made new in God’s new order. The vision is eschatological. It is God’s vision for a new earth where there will be no war, no suffering, no pain, no ecological destruction. “And a highway shall be there, and it shall be called the Holy Way” (verse 8). A highway, a broad way, a way for all the redeemed to embrace and travel together to eternal glory: “They shall see the glory of the Lord, the majesty of our God” (verse 2). Do you want to be on that highway? 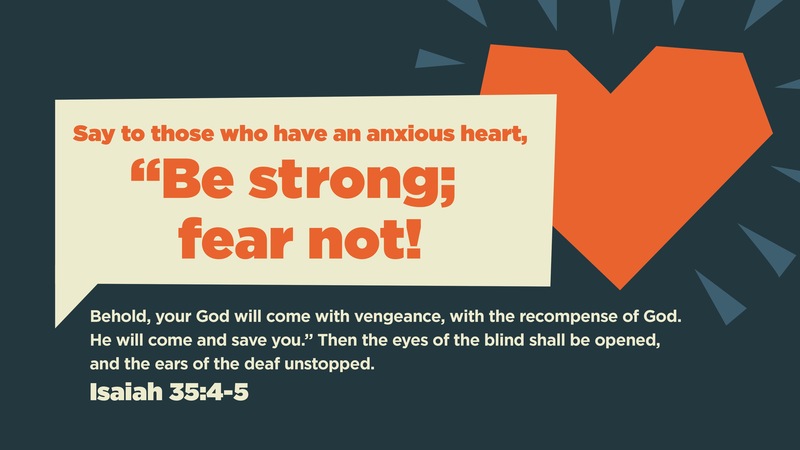 Then “Be strong; fear not!” And say to those who have an anxious heart, who are fearful, “Be strong; fear not!” But don’t be passive. Join God’s vision and work for it in whatever small or big way God has granted you to do. If we work with God against the forces of disorder we will walk that highway with heads and hearts illumined. That is the true power of the Lord: a powerful people walking with fearless trust in the ultimate goodness and deliverance of the Lord. Categories: Bible Reflections | Tags: eschatological vision, Isaiah 35 | Permalink.